My name is Curtis Tarver, and I am a Terps uniform apologist. I'm not saying I love them, but I certainly don't hate them like it seems so many do. First of all, let's get one thing clear: Don't think for a second that it's lost on me that the reaction we're all having is exactly what UnderArmour and the Terps wanted. These uniforms in primetime on Labor Day? Of course it's a publicity stunt. But in the process, they ended up with uniforms that I actually find a bit endearing. Let me first lay all of my biases on the table. I am a Marylander by association--that is, I went to undergrad in the state (UMBC), I married a Maryland native and have a bunch of Maryland friends and in-laws. I also have a good deal of my own family hailing from the Free State. In addition, I'm a bit of a vexillology (the study of flags) enthusiast, as well as a fan of heraldry, in which Maryland's state flag is deeply steeped. Interestingly enough, this isn't the first time I've found myself defending College Park uniforms on those very merits. 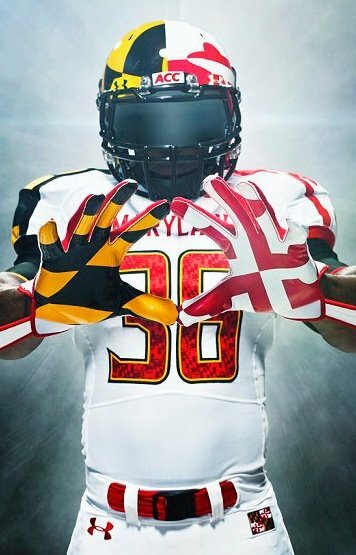 For starters, if you hate Maryland's flag, you're obviously going to hate the uniforms. If you're willing to look past that fact or at least understand the flag, here's the cliff notes version: The two themes represented in the flag are from the Calvert and Crossland coats of arms. The Calvert portion--the black and gold in the upper left and lower right which you also see represented in the Baltimore flag--is the coat of arms of Maryland's colonial founder, while the red and white Crossland portion is from Calvert's maternal side of the family. I've always given credit to College Park for representing all of the colors of their state flag; while most associate red and white with the Terps, their official school colors are actually red, white, black and gold, all of the colors of the state flag. They often make efforts to represent at least some of each of these colors in their uniform design. Now I will admit that the Calvert/Crossland colors on both the helmet and the shoulders may be a bit of overkill, and I probably wouldn't have opted for such. That said, I'd consider adding that helmet to the permanent rotation. With both used, however, I think UnderArmour/the Terps fell just short of an opportunity in front of them. 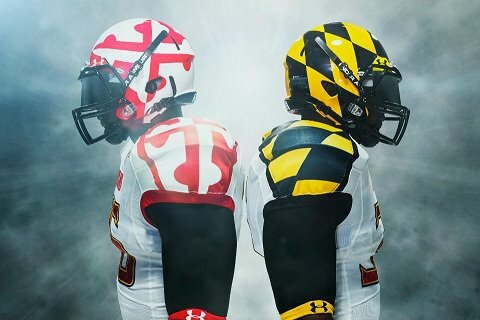 Have they seen fit to reverse the order of the flag pieces on the shoulders, they would have ended up with a truer representation of the Maryland state flag. With that configuration, a down lineman would quite literally be the Maryland flag staring you in the face. THAT's where they should have set their sights.